This article is about the "Deutsche Post AG". For other agencies called "Deutsche Post", see Deutsche Post (disambiguation). The Deutsche Post AG, operating under the trade name Deutsche Post DHL Group, is a German postal service and international courier service company, the world's largest. 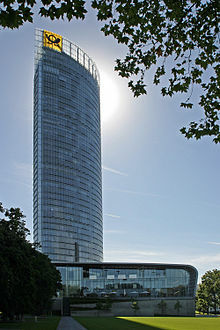 With its headquarters in Bonn, the corporation has 510,000 employees. The postal division delivers 61 million letters each day in Germany, making it Europe's largest such company. 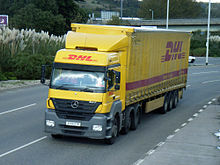 The Express division (DHL) claims to be present in over 220 countries and territories. The Deutsche Post is the successor to the German mail authority Deutsche Bundespost, which was privatized in 1995 and became a fully independent company in 2000. DHL Express is a wholly owned subsidiary. Since its privatization, Deutsche Post has significantly expanded its business area through acquisitions. In late 2014, the Group acquired StreetScooter GmbH, a small manufacturer of electric vehicles. Two years later, the Group acquired UK Mail, a business-focused postal service in the UK for US$315.5 million (£243 million). The former company became a division of the Deutsche Post European parcel network. The Deutsche Post DHL Group 2016 earnings before interest and taxes (EBIT) was €3.491 billion (up 44.8 percent over 2015), with a net profit of €2.64 billion on revenue of €57.334 billion. Return on equity, before taxes, was 27.7 percent. The Group's long term credit rating, in November 2016, was BBB+ with a Stable outlook per Fitch's. Deutsche Post AG is listed on the Börse Frankfurt (Frankfurt Stock Exchange) as DPW and is in the Euro Stoxx 50 stock market index. In 2016, 20.5% of the Group's shares were held by the state-owned KfW bank; 79.5% were freely floating: 65.6% held by institutional and 10.8% by private investors. The Deutsche Post DHL Group has become a large, world-wide company in about two decades. The following are significant dates in the development into its current form. 2 January 1995: Deutsche Bundespost Postdienst becomes Deutsche Post AG; this is the company's privatization. The government of Germany still owns a large share of the company; the state development bank KfW owns 50 percent. 1998: Deutsche Post begins acquiring shares in DHL International. 1999: Deutsche Post World Net acquires the Dutch distribution company Van Gend & Loos from Nedlloyd and in 2000 the Swiss distribution company Danzas. 20 November 2000: Deutsche Post AG becomes a fully private company, with a new Board of Directors, in an IPO listed on the Frankfurt Stock Exchange. The government of Germany sells one third of its shares and KfW bank sells some of its shares. December 2002: Deutsche Post AG acquires the remaining shares in DHL International. August 2003: The company acquires the Seattle-based Airborne Express (est. 1946). The company integrates Van Gend & Loos, Danzas, Airborne Express, and its own EuroExpress into DHL to form DHL Express. December 2005: The Group acquires the logistics company Exel in the UK, a£3.7 billion (€5.5 billion) takeover; Exel provided transport and logistics solutions for corporate customers. 2006: DHL GlobalMail UK merges with Mercury International. December 2014: The Group acquires StreetScooter GmbH, a small manufacturer of electric vehicles in Aachen, Germany. December 2016: The Group completes the purchase of UK Mail, a business-focused postal service - with "one of the largest integrated parcels and mail operations in the U.K." - for US$315.5 (£243) million. The former company becomes a division of the Deutsche Post European parcel network, although its web site reveals only a relationship with DHL Express. The postal division delivers approximately 59 million letters every working day in Germany, and provides services across the entire mail value chain, including production facilities at central hubs, sales offices and production centers on four continents. This division inherited most of the traditional mail services formerly offered by the state-owned monopoly, for which it uses the Deutsche Post brand. Its exclusive right to deliver letters under 50 grams in Germany expired on 1 January 2008, following the implementation of European legislation. A number of companies are vying to challenge Deutsche Post's near monopolistic hold on letter deliveries, including Luxembourg-based PIN Group and Dutch-owned TNT Post. In 2002, Deutsche Post was granted a license to deliver mail in the United Kingdom, breaking Royal Mail's long-standing monopoly. In 2016, in Germany alone, the Post – eCommerce – Parcel (PeP) division delivered over 1.2 billion parcels, an increase of 9.3% over 2015, much of it as result of shipping products purchased by customers on-line. The e-commerce aspect helped to generate a great deal of revenue. This division's revenue increased by 4.1 percent to €16.8 billion while earnings before interest and taxes (EBIT) increased by 30.8 percent to over €1.4 billion. The Express division offers worldwide courier, express and parcel shipment service, combining air and ground transport, under the DHL brand. It owns five airlines: European Air Transport Leipzig, DHL Air UK, DHL Aero Expreso, SNAS/DHL and Blue Dart Aviation. In 2016, this division's revenue increased by 2.7 per cent to €14 billion. The operating profit before interest and taxes (EBIT) increased by 11.3% over 2015 to €1.5 billion. DHL Global Forwarding this division carries goods by rail, road, air and sea under the DHL brand and includes the DHL Freight operation which runs a ground-based freight network covering Europe, Russia and traffic into the Middle East. In 2016, this division's revenue declined by 7.7 percent to €13.7 billion but operating profit before interest and taxes (EBIT) improved from -€181 million in 2015 to +€287 million. The DHL Supply Chain division provides contract logistics and corporate information solutions tailor-made for customers. In 2016, this division's revenue decreased by 11.6% to €14.0 billion versus 2015, but operating profit improved by 27.4% to €572 million. DHL Supply Chain provides warehousing and warehouse transport services as well as value-added solutions along the entire supply chain for customers from a wide variety of sectors. Corporate Information Solutions handles documents (collection, digitalisation, printing, storage, archival) of all types. In December 2014 Deutsche Post DHL Group purchased StreetScooter GmbH, a small manufacturer of electric vehicles in Aachen, Germany. By April 2016, the company announced that it would produce 2,000 of the StreetScooter Work model in Aachen by year end. The Work vehicle is equipped with lithium-ion battery packs and is powered by 30 kW asynchronous electric motors. The peak/continuous output is stated as 48 kW/38 kW. The range (before the need to recharge) is said to be 50 to 80 km, depending on the weight of the load and traffic conditions. The load capacity is 710 kg. Deutsche Post's 2016 annual report indicates that it plans to replace its fleet of delivery vehicles in Germany with the electric StreetScooter products "in the medium term". Electric vans and trucks with a much greater range will be required to achieve the very long term goal of replacing the Group's entire fleet of approximately 70,000 vehicles with electric StreetScooter vehicles. A mass production plan was announced in April 2016. StreetScooter GmbH would be scaling up to manufacture approximately 10,000 vehicles annually, starting in 2017. If that goal is achieved, it would become the largest electric light utility vehicle manufacturer in Europe, surpassing Renault which makes vans such as the Kangoo Z.E. The Deutsche Post DHL Group's GoGreen program is intended to reduce emissions of greenhouse gases and local air pollutants. The company has four interim goals for doing so, to be achieved by the year 2025. The long-term target, summarized by Frank Appel, Chief Executive Officer, is more aggressive. "From now until 2050, our mission will be to drive our business toward zero [logistics related] emissions. We are setting the standard for the future of the transport sector and doing our part to help the world community reach its goal of limiting global warming to less than two degrees Celsius." Deutsche Post – offers domestic mail services under its traditional name; the division is called Post - eCommerce - Parcel (PeP). DHL Express – brand used as an umbrella brand for worldwide logistics services. Power Packaging – supplier of food and beverage contract manufacturing and packaging services to North American companies. StreetScooter - electric vehicle manufacturer owned by the Group since December 2014. ^ a b c "Key figures". Deutsche Post DHL Group. Retrieved 25 October 2018. ^ a b "Annual Report 2014" (PDF). Deutsche Post. Retrieved 6 May 2015. ^ "The world's leading mail and logistics Group". Deutsche Post DHL Group Company Portrait. Retrieved 16 May 2018. ^ "Employees and workplace". Deutsche Post DHL Group. ^ "Company Portrait". DHL Company Portrait. Retrieved 16 May 2018. ^ a b "Deutsche Post DHL Group completes UK Mail acquisition". UK Mail. 22 December 2016. ^ Ben Meyer (8 March 2017). "Deutsche Post delivers record earnings in 2016 despite lower revenues". American Shipper. Howard Publications, Inc. Retrieved 27 March 2017. ^ a b c "2016 Report" (PDF). DPHL. Deutsche Post AG. 8 March 2017. Retrieved 27 March 2017. ^ "Investor Relations". Deutsche Post DHL Group. ^ "Creditor Relations". Deutsche Post DHL Group. ^ "The history of Deutsche Post DHL Group". Deutsche Post DHL Group. ^ "Germany to sell one-third of post office in IPO". CNN Money. 24 October 2000. ^ "Deutsche Post DHL Group completes UK Mail acquisition". 3 January 2017. Retrieved 27 March 2017. ^ "Deutsche Post Bilanz, Gewinn und Umsatz | Deutsche Post Geschäftsbericht | 555200". wallstreet-online.de. Retrieved 2018-11-05. ^ "45pc profit boost for Deutsche Post DHL". Logistics Manager. Akabo Media Ltd. 8 March 2017. Retrieved 27 March 2017. ^ "Deutsche Post DHL Group ends financial year 2016 with record earnings". Deutsche Post DHL Group. 8 March 2017. ^ "EXPRESS". Deutsche Post DHL Group. ^ a b Burns, Justin (8 March 2017). "Revenue falls, but earnings and operating profit up at DHL". Air Cargo Week. Azura International. Retrieved 27 March 2017. ^ "Deutsche Post DHL reports "record earnings" for 2016". Post and Parcen. 8 March 2017. Retrieved 27 March 2017. ^ Will Waters (8 March 2017). "DHL forwarding profits continue improving". Lloyd's Loading List. ^ "Deutsche Post DHL übernimmt StreetScooter GmbH". Deutsche Post DHL. Deutsche Post AG. 9 December 2014. Retrieved 26 March 2017. Deutsche Post DHL hat den Kaufvertrag für die StreetScooter GmbH unterzeichnet - ein ehemaliges Start-up aus dem Umfeld der RWTH Aachen mit dem Ziel, wirtschaftliche Elektroautos zu entwickeln. Mit der Übernahme der StreetScooter GmbH, die noch unter dem Vorbehalt der fusionskontrollrechtlichen Freigabe steht, übernimmt Deutsche Post DHL auch die Entwicklungs- und Produktionsrechte an den Fahrzeugen sowie die Mitarbeiter. Die StreetScooter GmbH ist ein Spin-Off der RWTH Aachen und als Konsortium aus rund 80 Industrieunternehmen der Automobilindustrie und verwandter Branchen gestartet. Es wurde 2010 gegründet und beschäftigt 70 Mitarbeiter. Seit 2013 sind in Aachen im ehemaligen Talbot-/Bombardierwerk rund 200 StreetScooter Fahrzeuge produziert worden. ^ "Deutsche Post will 2016 noch 2000 Elektro-Transporter bauen - manager magazin". manager magazin. Retrieved 2017-08-03. ^ "Technical Information StreetScooter Work (Kofferaufbau)". StreetScooter. StreetScooter GmbH. 2017. Retrieved 26 March 2017. ^ "Deutsche Post DHL makes its own electric delivery vans". DW. Deutsche Welle. 15 June 2016. Retrieved 26 March 2017. Provided its StreetScooters can be produced cheaply enough compared to the alternative of buying e-vans from established auto makers, the bottom line of the world's biggest delivery services company stands to benefit from producing its own delivery vehicles - whether or not it eventually adds profits from sales of e-vans to third parties. ^ "Streetscooter - Der tausendste Elektro-Transporter der Post". Frankfurter Allgemeine Zeitung. Frankfurter Allgemeine Zeitung GmbH. 23 August 2016. Retrieved 26 March 2017. Die Post will ihren gesamten Fuhrpark auf Elektro-Autos umstellen. Bis dahin dauert es noch. Einen wichtigen Schritt hat das Unternehmen nun aber gemacht. ^ Weiss, Richard (24 March 2017). "Even Germany's post office is building an electric car". Waterloo Region Record. Kitchener, Ontario. Retrieved 26 March 2017. ^ "StreetScooter presents new "Work L" model". DPDHL. Deutsche Post DHL. 20 September 2016. Retrieved 26 March 2017. ^ Weiss, Richard (24 March 2017). "Even Germany's Post Office Is Building an Electric Car". Bloomberg. Bloomberg. Retrieved 26 March 2017. When Deutsche Post AG couldn’t find a zero-emission delivery van that met its needs, it bought a startup and developed one. Now Europe’s largest postal service may start selling those vehicles — dubbed StreetScooters — to others, showing the potential for disruption in the rapidly changing auto market. ^ "2017 Deutsche Post AG Our GoGreen environmental protection program". DP DHL. Deutsche Post. 8 March 2017. Retrieved 26 March 2017. By the year 2050 we want to reduce all logistics-related emissions to zero – a highly ambitious goal. To ensure progress towards the 2050 zero-emissions target, we have set four interim goals to be achieved by the year 2025. Wikimedia Commons has media related to Deutsche Post AG.